Quite likely you have heard of Rajasthan, and quite likely you also had a chance to visit few of its cities like Jaipur or Udaipur, and quite possibly you must be wondering why your perceptions for Rajasthan are not fulfilled yet. 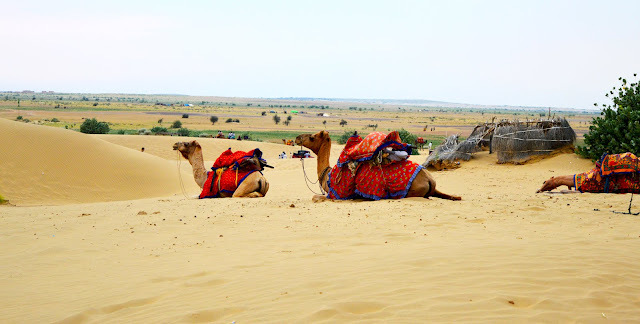 Let me start with the perceptions one by one, I come up with when I think of Rajasthan and the places to visit in Jaisalmer that fulfilled those desires. Known widely as ‘Land of King’, Rajasthan is rich in monuments and palaces which are now open for general public in the form of museums or forts. Though much of my desire to visit such palaces and forts are already fulfilled by Jaipur, Udaipur, Jodhpur and other cities of Rajasthan, but Jaisalmer wins the race when I got the chance to personally visit Jaisalmer Fort. Jaisalmer Fort is the old and the true Jaisalmer also known as ‘Golden Fort’. This is the only fort in Rajasthan where thousands of people reside within its walls. Jaisalmer Fort is the real heritage place where the king still sits on his chair and his progeny in front of him on ground on the occasion of ‘Dussehra’ every year. The fort not only has people residing within it, but also has lots of basic shops, handicrafts shops, temples, guesthouses and restaurants. The fort is equipped with super- pleasing items to shop but costly as hell, when compared to other places. I would suggest buying Rajasthan’s stuff from Jaipur market, if you are planning to visit Jaipur also. While the time we were getting ready for the trip of Rajasthan, somewhere inside I was creating images of sands all around. After all, this was the next perception of Rajasthan I had. Desert-ness which was missing till now from Jaipur to Jodhpur, I got to see in Jaisalmer. Sam Sand Dunes and Thar Desert, both are among the most popular regions taken into consideration for dune bashing. Jeep Safari and Camel Safari both are available at these locations. We opt for Jeep Safari at ‘Thar Desert’. This is because, the second day stay at ‘Rawla Tents’ in Jaisalmer, was providing us the Camel Safari at their privately owned Sand Dunes. These activities are required to be pre booked. One more thing that night Jeep Safari is also an option considered more often by visitors. We started at around 5 pm in the evening, which altogether was an awesome experience. We settled bargaining with the price of Rs 1000 for Jeep Safari starting from Royal & Mughal Desert, also covering Thar Desert. It was a great ride experience. They gave a halt at Thar Desert to enjoy the Sand dunes and take pictures. There was also a small shop for tea and coffee. Few Snacks were also available there. It was kind of Enjoyment till exhaustion, as we can stay there at the place of halt for any amount of time. We spent at least an hour there. We took lot of pictures with the camels and the scenic beauty all around. The moment arrived when we could feel that it is getting dark and the wind has started blowing very hard. We asked the driver to move back now. As we started, it started raining heavily that we all got wet. Night time and Rain, added to our fun of Jeep Safari. We were also able to experience night Jeep Safari. 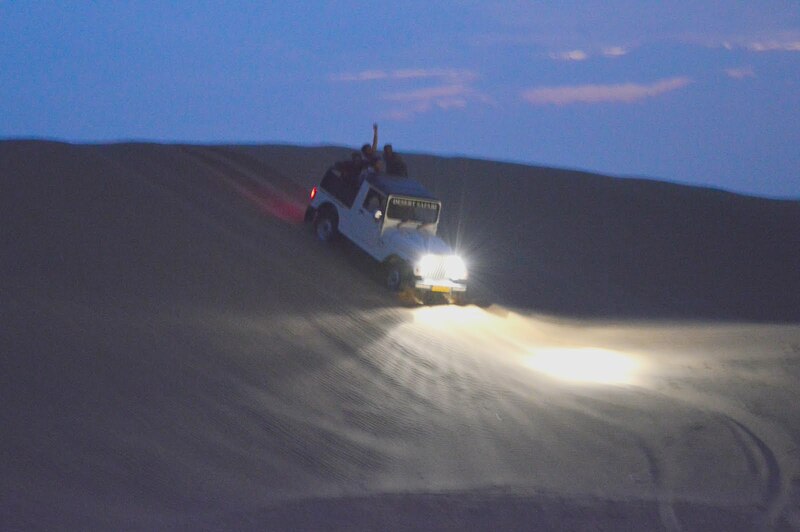 Our Jeep was finding its way out in the night among the Sand dunes. It was a totally different experience where you are much away from all your day to day worries. It seems that the god was showering his happiness on us and on this desert. While on our way back to Starting point our parents were enjoying conversation with the Jeep Driver. As per him, the people of Jaisalmer are very honest towards their Nation. On reaching the starting point, we all settled down in our car to reach back to ‘Rawla Tents’. Luckily we already had few spare newspapers in our car, which helped us save our car seats from getting wet. Thanks to Google Maps, to help us find our destination in such a rainy night. Something beyond perception is presence of Wind Mills in Jaisalmer. We had only heard about these structures and read in books in our childhood, which we came across with over here. 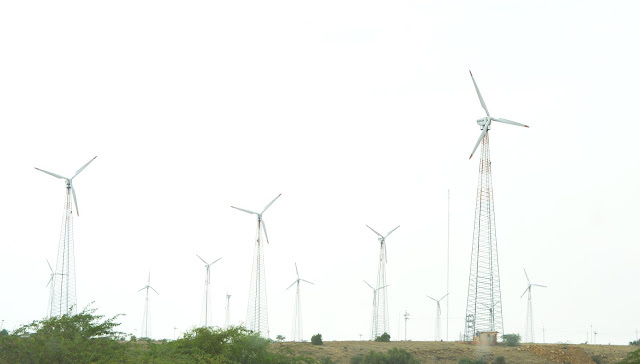 The Jaisalmer Wind Park is India's largest operational onshore wind farm. A windmill is a mill that converts the wind energy into rotational energy by means of blades, which is then used to generate electricity. Wind Mills in Jaisalmer covers the huge land area. We enjoyed capturing those wind mills in our cameras, to re-create the new images of wind mills with us besides them. Bada Bagh meaning ‘Big Garden’ comes with an entry ticket of Rs. 100 per person (camera extra). Though the amount is quite high but the visit during sunset or sunrise will surely fill the gap. It contains a set of royal cenotaphs, or cenotaphs of Maharajas of Jaisalmer state, starting with Jai Singh II. Lunakaran, son of ’Maharawal Jaisal Singh’, completed the construction of Bada Bagh after his father’s death. It is located in the middle of the desert, so it provides you with the best of the scenery. This garden fulfills my next perception of sand made construction. Patwon ki haveli situated in the main city of Jaisalmer is one of the distinct destinations not to be missed. It is not a single haveli, but 5 havelis for each son of ‘Patwa’ (Rich man of that time in Jaisalmer). It took around 50 years for its completion. The Haveli is renowned for its ornate wall paintings, intricate yellow sandstone-carved jharokhas (balconies), gateways and archways. Although the building itself is made from yellow sandstone, the main gateway is brown. It comes with an entry ticket of Rs 100/- per person and free for children below 12 years. Also be prepared in advance because you need to walk a little more at this place. Inside and outside you will get to see great artwork. Covering the long route from Jodhpur to Jaisalmer, we managed to reach Tokyo Palace in the evening. It was a nice and well built architecture. It is located quite close to the main road, so we don’t need to hassle much to find the routes. The staff was very helpful and professional. They were running for the comfort of the guests. Rooms were large and comfortable. It has a rooftop restaurant, where we enjoyed our breakfast, also providing us the view of Jaisalmer Fort. I also observed that foreigners often consider this place for their visit to Jaisalmer. I recommend stay of two days in Jaisalmer. One may be in hotel and other must be in Camp, to experience camp stay of Jaisalmer. While looking for the stay in Jaisalmer and after much of R&D ;-), we decided to experience a day in the Camps of Jaisalmer. Undoubtedly, it is going to offer you with the classic rural experience. The village lifestyle crafted to your whims and fancies. Village life is a life where the soul of India resides. 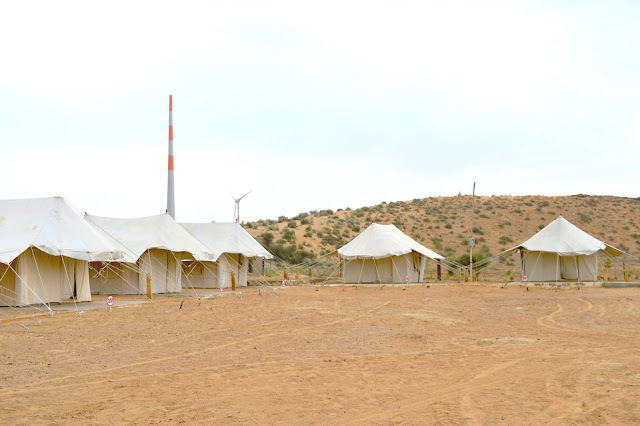 ‘Rawla Camps’ is going to provide you with the same in a very convenient and effortless manner. It is situated in a very quiet place, sand all around. Also it rained that day that made us feel like in some heaven. Rain in Desert- Just an awesome experience. Manager of the Camp said, “Even the rain is welcoming you! 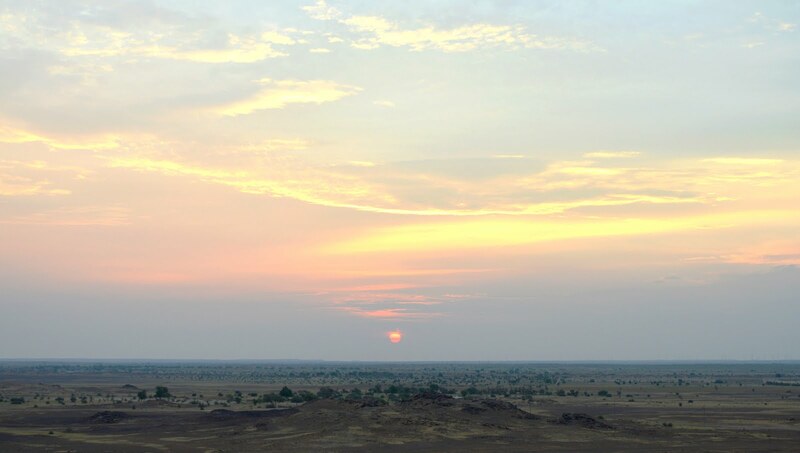 !” He added further by saying that it had rained after almost two months in Jaisalmer. After setting down in own rooms, we were ready to go for Jeep Safari, which is already mentioned above. We were beforehand informed about the cultural program organized specially for us guys. This is the reason we were quiet excited about our return from Jeep Safari. The time has come now when we are back to our camp, but all wet due to surprised rainfall. So we all waited for the rain to take a halt, meanwhile we all prepared ourselves to get ready for the cultural program. Rain stopped, and we all assembled in the dining area where the program was arranged. The chairs were set and the snacks were being served too. The performance was quiet professional. They showcased their traditional dance and music using their traditional instruments. The food was though average in terms of taste. They have got their private Sand Dunes, where they arranged camel ride for all of us in the early morning. The camels look healthy and active. We enjoyed feeding grasses to the camels and captured amazing pictures with them. The ride was for a reasonable distance, and we also offered a tip (small amount of money) to the camel man. We had a great sunrise view early morning. There is no other tent or any accommodation nearby so it is kind of separate location made us feel special. One thing I would like to add is that not to expect a luxury stay in Camps otherwise you won’t be able to enjoy and also you won’t be able to experience the true village lifestyle. By Road is the most preferred way for many of the Indians to visit Jaisalmer along with other famous cities of Rajasthan which includes Jaipur, Udaipur, Mount Abu and Jodhpur. The way we also opted and our favorite one. 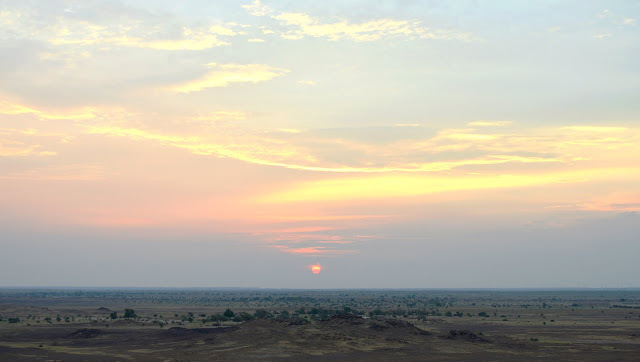 While on road trip, the most preferred way to reach Jaisalmer is via Osian and Phalodi highway. This is the best way as it provides you the best of the highway to drive on. By Air is also an option available via Udaipur/Jodhpur/ Jaipur airport and from there, continue by road till Jaisalmer. This is the most less time consuming way out. Among all, Jodhpur airport is the closest domestic airport functional throughout the year. By Train is another option available. Direct trains are available from Jaisalmer to Jodhpur as well as Delhi. By Bus is going to be a very hectic option and time consuming option too. There are no direct buses from Delhi to Jaisalmer. You can opt to switch bus in Jaipur from where sleeper coach runs regularly. But the tickets need to be booked in advance due to limited number of seats. As I always believe, Spending money on Travel is never a pain. Now is the time to mention our expenses. Total Expenditure for 2 nights and 6 people – Rs: 26,500/- that is 4,600 Per Person Approximately. After completion of Jaisalmer we head straight back to Delhi. I know this is quite a long route but we were available with two expert drivers with us, Nitin and our father. We were coming back via roads of Bikaner. Though we were ending our Rajasthan Road Trip over here, but it was not an end but the beginning. Beginning to understand that life is all about living. Live by complimenting yourself with such surprises. Its not Water that Inspires Blueness of Jodhpur !! This is the best traveling tour that you have got here and I am really desperate to visit this place. From a while I have been planning to see such wonderful place to see from a while. 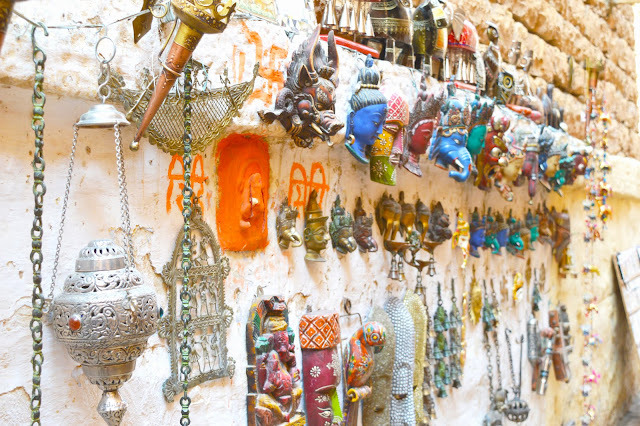 This looks like a complete guide on Jaisalmer city. Thanks for sharing much needed information while planning a trip to Jaisalmer. I think one should plan at least a 3 trip to enjoy all Activities in Jaisalmer. hi sapna this is actually i was looking for.. thanks for sharing your experience.. by any chance do you still have contact number of rawla tents?